Sometimes life gets so busy that we feel like there isn’t any way that we can reach out. Yet even what’s small and simple can make a big difference. So here’s my challenge to you: take five minutes today—yep, just five—and add some extra joy to the life of your friends and family. Remind them that they’re irreplaceable to you and God. We’re all in this together, and we need each other. It’s easy to believe that we’re the only ones who ever get discouraged. But having connected with thousands of women, I can assure you that we all share the same struggles and hear the same lies. When we share truth with each other, that can begin to change. “Encourage one another daily, as long as it is called ‘Today,’ so that none of you may be hardened by sin’s deceitfulness” (Heb. 3:13). Pause for a moment and ask God, “Who in my life needs to be encouraged today, and how can I be part of touching their hearts?” He knows what those around you need, and you can be his voice of love today in your own wonderful way. I’m praying for you and cheering you on as you encourage others today! 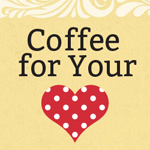 Welcome to Coffee for Your Heart! The concept is simple: You’re an encourager so I’m asking you to pour out a little love with your words every Wednesday. The writing prompt I gave you last week was: “A small thing that makes a big difference is…” Now it’s time to link up your blog post or leave a comment sharing your answer. We’ve been doing specific writing prompts each week and I’d like to give you a bit more freedom. This week simply write an encouraging post. Yep, the topic is up to you. Just share whatever is on your heart that could encourage someone else. Then link up your post here next Wednesday. Beautiful challenge, Holley. I will take you on! I’ll take Five minutes to focus in on someone and really show love. Small things like this really do multiply. Thank you for your beautiful writing. I love reading everything you write. So encouraging and inspiring. God is good. What a sweet post, Holley! You are so right that there are times that we can think we are alone in feeling discouraged. And I have found that offering to others the encouragement we ourselves need actually dissipates the clouds of our own gloom. God made life magical like that. And I am grateful. Grateful for your words today, too. Words matter. Monday I was feeling discouraged and a blog reader left the sweetest comment of encouragement on my post. God’s way of telling me I was doing exactly what I needed to be doing. Going to shower some encouragement on some friends and family today! 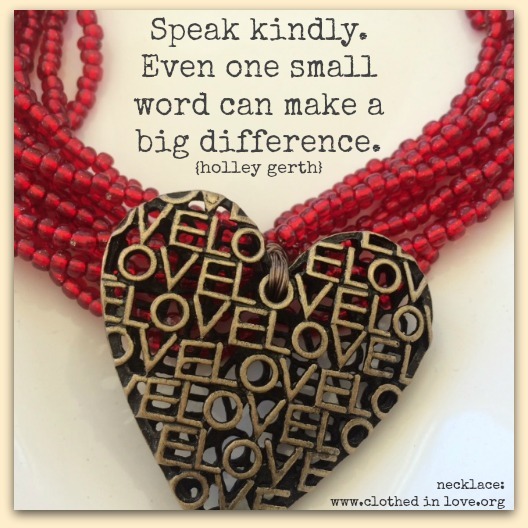 Thank you Holley for a call to extend strength through LOVE to at least one person today. The lover of our souls also, called the twelve to “LOVE” one another and that the world knows us (christians) because we show LOVE to one another. It is the greatest gift we can extend to everyone free of charge with priceless and ongoing results. Love to you my sister in christ. Holley, it seems we were in one mind and one accord this week. To be an encourager is to make a big difference. Thanks for hosting this community. Just wanted to say thank you for all you do. I can imagine you wonder at times who’s reading and what impact you are having. Do know that I often read and I am encouraged through your kind reminders of God’s love and faithfulness. thanks Holley! A wonderful reminder and it really does help to look outside yourself when you are feeling down and pick someone else up. It is like jogging for the soul. I am taking your challenge for five minutes now so I don’t forget! Have the best day yourself! you always are doing stupid things, STOP breathe. I remembered the quote now what was the lesson, put the top on tight the blessing only the cap came off there could of been bath oil everywhere. Second lesson learned I make mistakes be gentle with my self. I could of allow that issue and many others to ruin my day. The second blessing to share with you. “A small thing that makes a difference is [a smile].” Can you imagine how many people are blessed when they see you walk in the room with the most beautiful glowing smile on your face? It can do wonders for one’s morale and spirit. A smiling face filled with God’s peace is illuminating! So smile today and be a blessing to someone you know or even do not know. It just might make all the ‘difference’ in the world to them. Today I received an email from an acquaintance I haven’t seen face-to-face in years. Her words warmed my heart all the way to the bottom! Immediately I emailed her back. Wasn’t long before she responded, so thankful and appreciative for my quick answer. She, too, was encouraged. Just a few uplifting words lobbed back and forth put extra bounce into both of our steps. Small deeds CAN be powerful catalysts for change! It takes great courage to be an encourager! Giving away part of yourself freely, unconditional, sincere spoken words to another wrapped in love – inspired by the One who gave so freely and lovingly to us. . . I just love seeing that necklace here. It’s such an expression of mutual love. This is a small thing…or maybe even a big small thing that makes a difference!! However I amm experiencing issues with yyour RSS. After all, this may be the internet, plus it’s to become taken very seriously. For Beatlemaniacs, we otherwise this could happen video was pretty funny. oh sorry, that is not you I know you might be more than that.